Their tours range from a short but scenic 30 minute tour of the Great Barrier Reef, to a Heli Pub Tour through the Atherton Tablelands, to flying out to spend the day on the remote Lizard Island. 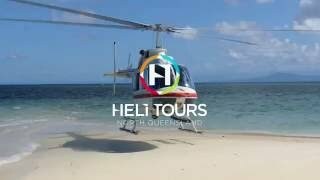 In addition to their unique offerings, HeliTours NQ are more than happy to build tours to suit your budget and time frame, on request. They can take you anywhere from Cairns through to Cape York and the Torres Strait. HeliTours NQ values high quality service over high-quantity seat-filling and ensures a personalised experience for all guests who fly with them. Their company is locally owned and operated. It’s one of their most popular tours and there’s little wonder why! 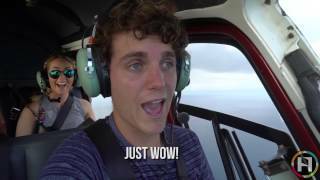 The Great Barrier Reef (GBR) is a wonder of the world and this 30 minute helicopter flight lets you appreciate it's beauty from above. Highlights include: Green Island, Outer Great Barrier Reef, Upolu Cay and Cairns. 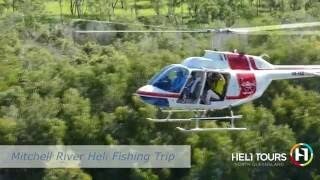 Explore the Atherton Tablelands on this unique helicopter-pub adventure. Sit back and relax as our experienced pilot flies you to 3-4 different food and drink establishments. A great way to see and taste what the Tablelands has to offer! Scenic highlights include: Walshs Pyramid, Crater Lakes National Park Lake Tinaroo, Barron Gorge, Cairns. See two World Heritage Listed areas side by side - the Great Barrier Reef and the world’s oldest continually living rainforest. See the many blues of the Great Barrier Reef from the air before circling back and flying over the stunning Fitzroy Island, Barron Gorge National Park and Stoney Creek. Highlights include: Green Island, Fitzroy Island Outer Great Barrier Reef, Upolo Cay, Barron Gorge National Park, Stoney Creek and Cairns. One of the great things about Cairns is that you don’t have to travel too far to see great things. Highlights of this tour include: World Heritage listed Rainforest, Barron Gorge National Park, Stoney Creek, Wangetti Beach, Port Douglas, Mossman Gorge, the spectacular Great Barrier Reef and Cairns. Depart Cairns and follow the Great Barrier Reef Highway to Mossman Gorge via three cascading waterfalls. Fly over the Daintree Rainforest, the oldest living rainforest in the world. 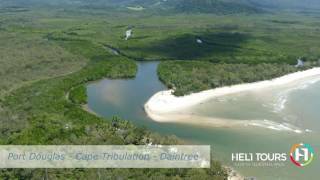 Track along the Mighty Daintree river out through the mouth to Cape Kimberley and Cape Tribulation, the only place on earth where two World Heritage area’s meet! Take in the breathtaking views of the Great Barrier Reef as we return to Cairns. Fly the colour spectrum of North Queensland and experience the many landscapes the region has to offer. Departs from Cairns. Highlights include: Johnston River Gorge, Undara Volcanic National Park, Blencoe Falls, Wallaman Falls, Hinchinbrook Island, Great Barrier Reef and Cairns. While many travellers know that Cairns is the gateway to the Great Barrier Reef, travellers may not be aware that the outback is also very close to both Cairns and Port Douglas. “Out Back of Cairns” takes you west of Cairns, soaring across the Great Dividing Range and over a changing landscape before landing at the Chillagoe Caves. The limestone in the caves was deposited as calcareous mud and coral reefs 400 million years ago on the bed of shallow sea where Chillagoe is located today. Who would have thought that the Great Barrier Reef was in the Outback? Heading back towards the coast we will pass over majestic Mt Mulligan which is reported to be twice the size of Uluru. We continue back to the coast before tracking back to Cairns or Port Douglas and your accommodation. 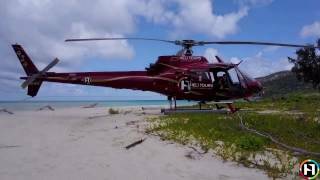 The Great Barrier Reef is a wonder of the world and the best way to truly appreciate its size, scale and beauty is to take a helicopter flight with Helitours North Queensland. This 45 minute scenic flight will create memories to last a lifetime. Highlights include: Green Island, Outer Great Barrier Reef, Oyster Reef, Upolu Cay and Cairns. The Great Barrier is one of the Natural Wonders of the World. It is a once in a lifetime experience for so many people. With that in mind, Heli Tours North Queensland oﬀers you the chance to have the Great Barrier Reef all to yourself. Marvel at this incredible spectacle from the air before landing at a deserted sand cay where you will snorkel amongst beautiful corals below the azure waters. It is exclusively yours to enjoy. Your pilot will set up some sun lounges, provide some snorkelling equipment and will remain with you while you explore this natural wonder. Refreshments will be waiting for you as you soak up the sun and the tranquillity of Tropical North Queensland. You will return once again over the Great Barrier Reef to Cairns, where you will be transported back to your accommodation. There is a lot of fact in the statement “The further North you go the more unspoilt the scenery”. Be treated like a VIP after we collect you from your accommodation and transfer you to our helipad. Depart and fly north over the stunning Daintree National Park, the oldest living rainforest on the planet. Take in the sights of the Daintree River, Cape Tribulation and Bloomfield. Leave the land behind as we fly out over the Coral Sea to one of the more spectacular parts of the Great Barrier Reef - Lizard Island. Land just in time for morning tea and refreshments before enjoying the activities the island has to offer. Enjoy a gourmet picnic lunch before departing for home. Experience the Great Barrier Reef from the air on the journey home, flying over Mackay, Pullen and Undine Reefs before arriving safely for your transfer back to your accommodation. place not only for its spiritual significance but because it records Australia's national history. Come on a journey to this remote landscape and unravel the stories, thousands of years old, that are hidden within our rock art. Discover the might of the Daintree River from above the water and on the water with this Fly and Cruise Combo. Departing Cairns fly north over Barron Falls, Stoney Creek, Barron Gorge National Park, Port Douglas and Mossman Gorge before arriving at the Daintree River Cruise Centre. Enjoy morning tea on the banks of the river before climbing aboard your private boat for a 1.5 hour cruise. Keep your eyes open for some of the animals that call the river home, including the Estuarine Crocodile. After the cruise, it’s back into the helicopter for your flight back to Cairns, including a scenic flight over the outer Great Barrier Reef. Combine their 2 hour reef and rainforest flight “The Backyard of Our Region” with an unforgettable 90 minute tour of Cape Tribulation via horseback. Ride your way through the oldest living rainforest in the world, crystal clear mountain streams and the pristine ocean edge of the spectacular Cape Tribulation Beach! The tour caters for beginners, intermediate and experienced riders on a group of very friendly and well trained horses. Explore the Torres Strait Islands, a region rich in natural, historical and cultural beauty and diversity. Highlights include: Great Barrier Reef, Prince of Wales Island, Thursday Island and Horn Island. Takes you from Horn Island, over the Torres Strait to the very tip of Australia – Cape York. Highlights include: Great Barrier Reef, Tip of Australia and Horn Island.